My laundry room makes me crazy, piles of laundry and jumbled hangers everywhere. 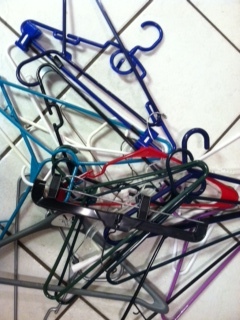 I waste more time un-jumbling hangers than doing laundry. Clearly, I need a better system but instead of taking twenty minutes and creating a new system for my hangers, I have lived with it for years. Our minds are like our laundry rooms. We want clean, organized, working rooms. We operate our lives with dirty, jumbled disorganized messes. Our hearts and minds are a jumbled mess of memories, TV shows, books we read, things people have said to us, school and life experiences all smashed together. These mashed and jumbled memories are the hangers,that we attach all new experiences too. Each new experience we add to our memories gets categorized and hung up by our beautifully crafted minds. All the input about childhood gets hooked onto our “childhood hanger” in our minds. Some peoples “childhood hanger” would be good, others would be bad. Each of us, as individuals has our own past experiences and resulting “mind sets”. When we choose to put into our hearts and minds; vile, negative, nasty or useless input we are creating more space in our brain filled with vile filth. It all goes somewhere nothing is lost. The misery comes when we try to use our brains, and out comes all this filth attached to our hangers. This vile junk, impacts our ability for our minds to work properly. We begin to see the world as “everything is negative”, “nothing good is going on in the world” producing a hopeless mindset. The vile, putrid stuff attaches to, our “friends, family or work hangers” creating negative thoughts about our relationships. With these negative mindsets now in full operation, our view of our entire world is altered, we are not seeing things clearly. It is extremely important to guard your heart. What you bring into your heart and mind is who you become. Create a new system. 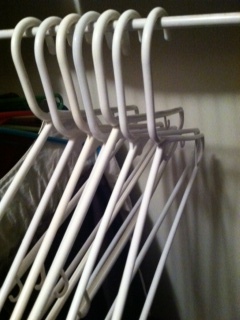 A system that allows, for the Lord Jesus to come in and straighten and evenly space our hangers, washing each one white. He wants us to be operating our lives in a clear and clean room where our vision isn’t clouded. He wants us to know the Truth and actively seek it, with all our hearts. The truth is; “In this world you will have trouble. But take heart! I have overcome the world.” John 16:33 (NIV). Surrender is the key. Begin to discover, pull out and expose the grey/black hangers and allow Jesus to wash them. The church word is sanctification, I think of it as allowing Jesus to clean and organize my mind and heart. First the Holy Spirit convicts you of the sin, so you can see it, and then you confess it to Jesus and ask for forgiveness, then Jesus washes you clean. This washing creates a new, clear and operational mind, ready for action.